Way in Northeast Edmonton, nestled within a dramatic curve in the North Saskatchewan River, is a very special piece of land that has incredible natural, agricultural and historical value. Doug Visser owns the land. He feels the land itself has significance, and wants to conserve its range of values. It totals 233 acres – that’s about 1 ½ quarters, of which over 180 acres is native habitat! To the north is the largest old growth forest within the city of Edmonton – 73 acres – and it’s home to deer, moose, coyotes and more. The biodiversity is amazing, too. The dominant habitat types are mixedwood and coniferous forest, with many shrubs including chokecherry, saskatoon, high and lowbush cranberry, and beaked hazelnut. Over 80 species of birds have been observed, including waterfowl, birds of prey, shorebirds, woodpeckers and songbirds, and about 15 Species at Risk have been spotted, including the Peregrine Falcon, Sandhill Crane, Sora and Baltimore Oriole, and the adjacent curve of the river is important habitat for Sturgeon. Also, parts of the old growth forest have been used by Indigenous people for many decades, and is currently used for traditional ceremonies and educating indigenous youth, since medicinal plants grow there. Lady Flower Gardens (LFG) is a social justice community garden. It occupies 10 extremely fertile acres. LFG is a non-profit that works with at least a dozen organisations in the city like the Food Bank, Mustard Seed, Hope Mission, Bissell Centre or immigrant centres. It provides education and the opportunity for these clients to get in contact with the land, help work, weed, and harvest it. The food produced from this land is shared with the participants, as well as with the organisations assisting the impoverished, thus helping people help themselves. What a gift LFG is to our City’s disadvantaged communities! The southern portion of the land is mostly agricultural – almost 130 fertile acres, with south-facing slopes, and a wonderful micro-climate for market-gardening. In addition, adjacent to both the north and south of the land, are 3 riparian acres by the river. What an amazing gift it is for Edmonton to still have areas like these within city limits! The Edmonton and Area Land Trust (EALT), this region’s conservancy, is delighted to be celebrating 10 years of nature conservation in the Edmonton region. We are working with Doug Visser to place a Conservation Easement on his lands, to conserve biodiversity and agricultural lands within Edmonton, in perpetuity. Doug Visser had already launched a fundraising campaign for the stewardship endowment for the agricultural lands. This is held at the Edmonton Community Foundation, and Doug contributed $70,000 to match public donations – an incredible commitment to agricultural conservation. Unfortunately, we need funds to conserve the biodiverse lands too, and despite the significance of this land, its native habitat, and the species at risk found there, last year’s application to the Provincial Land Trust Grant Program was declined. This is unfortunate to say the least, since it pays for legal and appraisal fees, as well as baseline documentation and conservation management planning, all of which land trusts are obliged to do. However, EALT intends to continue to seek funding sources. In addition, Doug Visser is prepared to make a contribution to these ‘front-end’ costs, if the public steps up for such donations. 4. Agriculture Tour: the place where local food security is exemplified, unique urban farmland tour, led by the farmer. 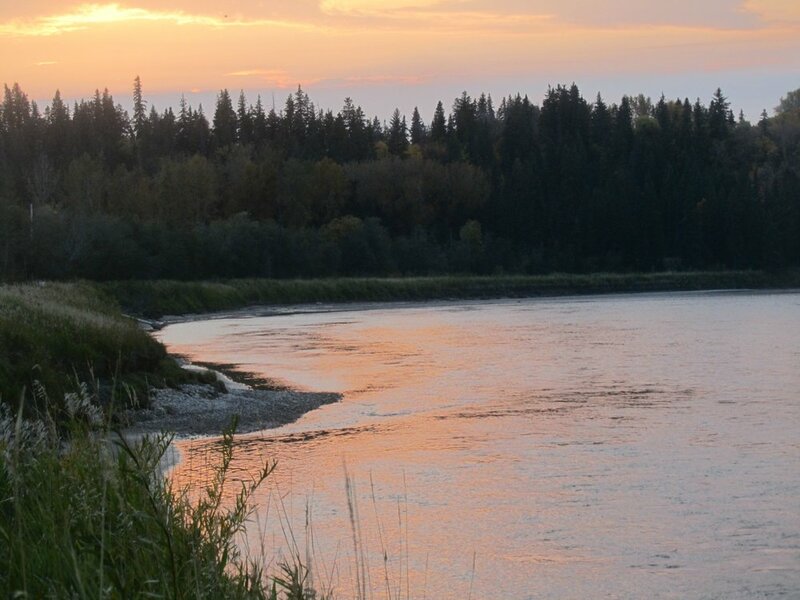 This is a unique opportunity to experience 230+ precious acres of land tucked in a curve of the North Saskatchewan River, containing both agricultural lands and Edmonton's largest old growth forest. Spaces for the interpretive tours are limited! All tours will only run in the morning and then the Forest Therapy tour only in the afternoon on July 28th. Photography credit goes to Patrick Kyle, Patsy Cotterill, Lu Carbyn, Gerald Romanchuk, and the landowner of this special piece of land.